I had my doubts about the title this time. The picture could have been called Bad Companies, Dubious Shelter, Not So Safe, Sour Sweet Dreams or whatever. 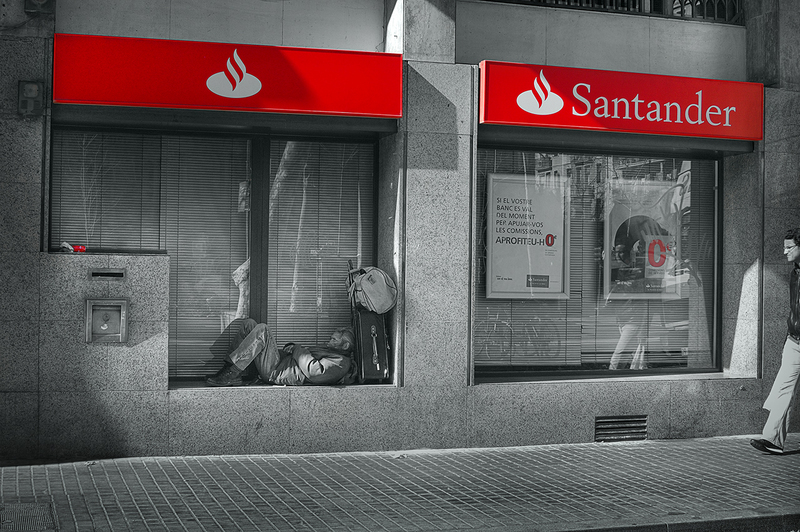 I finally decided for how something that is so close to this person like Bank Santander in this case can give him so little and yet ironically offer improvised shelter. Framing is awful, sorry about that. Red I kept to stress the logo of one of the most prosperous banks in Spain. The rest is obvious. Yes, the irony here is good. The red is a good idea for the subject matter. Very strong and speaking a story photo. this photo speaks out what words will not achieve...the colour red say a lot too!